Ever texting with a friend and wishing you could just pop in an infinity symbol or maybe the copyright mark? You won’t find it under your iPhone’s standard keyboard. Or are you emailing with a client and trying to send a quick piece of HTML code? A new iOS app lets users access special character symbols, including math symbols, Greek symbols and their corresponding HTML. I developed the app to address one of the most annoying things about writing on iOS: finding symbols. I am a mathematics major and also study quite a lot of physics. Both require a very frequent use of symbols and characters which aren’t found on QWERTY keyboards. OS X has a very handy keyboard and character viewer that carries a big chunk of the Unicode library. However, iOS has nothing that comes even remotely close. I created a library of LaTeX snippets in TextExpander but that mostly went away with iOS 7. As a result, I am practically unable to take notes on iOS in most of my classes. The app is fairly plain, which makes it easy to use. Simply open the app to scroll through various symbols and characters to find the one you need, or use the search field. 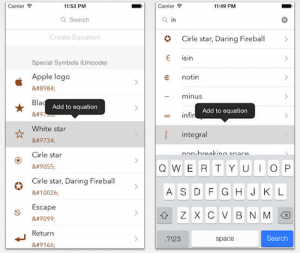 Select it and then choose “Copy Symbol” or “Copy HTML.” An “equation editor” lets the user copy multiple symbols at a time, so you don’t have to keep opening the app. It’s also where you can set up an equation within the app. The free app, which launched just a week ago, has already scored a slot under Apple’s “Best New Apps” screen.